Everyone has a church story. …It was wonderful. It was horrible. …I quit for now. I quit for good. …If it weren’t for the people, I would love the church. …If you find the perfect church, don’t join it because you’ll wreck it. We often think that when we have a good church experience we do well in our Christian life, but when the church struggles we fall back. This can be the case. Division, apathy, immorality and many other problems can cause harm to believers. –>> Every church will have struggles and these struggles are essential to spiritual maturity. One of the primary ways God will conform you to the image of Christ is through your positive and negative experiences in Christian community. 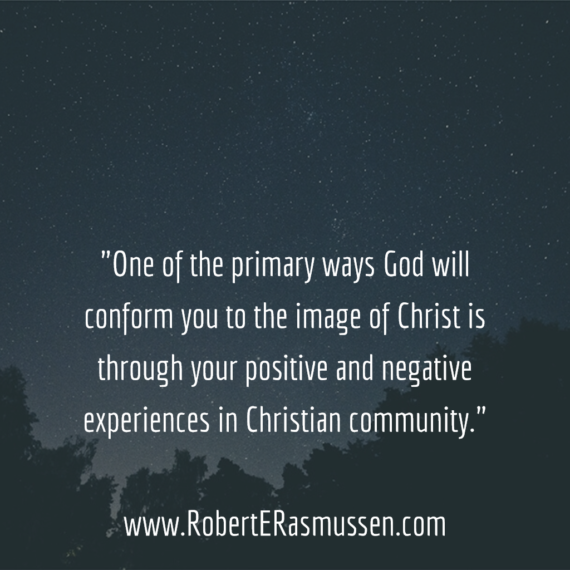 A primary way God conforms you to Christ is through your positive and negative experiences in Christian community. 1. True Christian community is gospel formed. By “gospel formed” I mean that the gospel (which at the core is Death, Burial, and Resurrection of Christ) is the pattern God uses to shape mature disciples. This is true for us as individuals and Christian groups. I won’t go into a lot of detail here, only to say that when communities go through death-like experiences, it is very hard! 2. 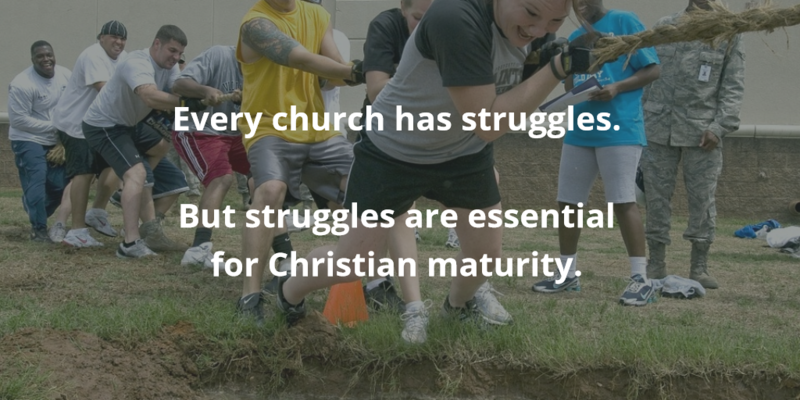 Hard times in community call us to greater growth. The Apostle John reminds us that Jesus’ sacrifice remains the pattern for true community, “By this we know love, because He laid down His life for us. And we also ought to lay down our lives for the brethren” (1 Jn. 3:16). Do you see the death of Christ in that verse? Do you see the sacrifice asked of believers in community? The church goes through hard times so that you can learn to imitate your sacrificial Savior. I know, not easy to hear! 3. Because Jesus rose from the dead, His communities can experience His risen life. The community of Christ is to be conformed not only to His death but also to His resurrection! The community of Christ is to be conformed not only to His death but also to His resurrection! As we endure, we will experience His grace, and will realize that we are living a supernatural life in community. And the world will see that we are different because Christ is living His life through us. It is sad that we sometimes bail out on a church in its death-stage and miss out on its resurrection-stage! That’s why most times we should hang in there. Would you like to learn about being gospel-formed? God is conforming you to Christ in many ways — not only in community. Also in your family, in holiness, and in suffering. I have written some lessons which explain it. They are prepared and ready to go. All you need to do is sign up for my “good news giveaways”!